In chicken gyro post I mentioned my childhood favourite paratha rolls and Karachi food. I won’t hesitate to admit that most of my attempts at making these wraps were not very successful. You can make the most amazing filling using any kind of meat; grilled, barbequed, smoked, roasted etc but if the wrap isn’t holding it all nice and tight, you won’t be pleased. 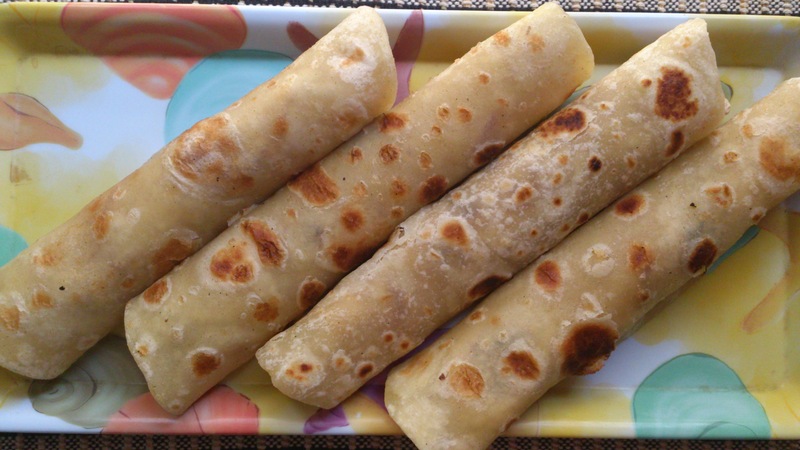 Crisp and flaky paratha can not be shaped into a roll; You need a “flexible” paratha. The recipe requires very basic and minimum ingredients. Great for school lunch box too. Combine flour, semolina, sugar, salt and ghee/cooking oil in a mixing bowl and knead with water to form soft but not sticky dough. You can use an electric mixer with dough hooks attached or use a food processor to make the dough. Put dough in an airtight container and refrigerate for at least an hour. Marinate the chicken with salt, black pepper, cumin, garlic, lemon juice and yogurt for an hour. Heat 3-4 tbsp of oil in a medium pan and add marinated chicken strip. Let it cook on medium flame, stirring occasionally, till cooked through, 7-10 minutes. Turn the flame off and stir in cream. Lets make parthas now. Divide the dough in 4-5 equal portions and form each piece into a ball. Flatten the ball and roll into a round disc, around 6-7 inch in diameter, depending on the size you want. Use extra flour to dust the surface to avoid sticking. Heat a frying pan on medium high flame. Carefully place one rolled paratha on the frying pan and let it cook for around 30-45 seconds. Flip and brush the up-side with 1-2 tsp of ghee/oil. Flip again and brush the other side with oil and then flip again to cook through. Repeat with all parathas. Place required amount of chicken filling on each paratha, some sliced onions and tamarind sauce and wrap into a roll. There is a brand Syed Diet Atta (flour) in Pakistan which has a variety of flour blends. I used the Platinum blend which has rice flour, quinoa, sorghum flour ( jawaar ka atta in Urdu). I DID NOT put semolina; only salt, sugar and ghee/oil for making the dough. Always rest the dough for at least an hour. The rested dough is easy to handle. You can use anything to make filling, make it spicy or tangy, even leftover meat. Use as little or as much oil as you prefer for frying a paratha. I used bottled tamarind sauce, Mitchell’s, which is a local brand. Feel free to use whatever you like. Sounds good! Ghost pepper would be a decent addition to this!